In previous blogs I have referred to some of these records. Recently the full entries in the Tithe Applotment Books were made available in digital form (summary data was available before) and I thought it might be a good idea to show those for our family. They do raise issues with my previous thoughts, but that is inevitable as knowledge evolves, it does not appear all at once! As all sorts of uncommon words crop up so I have provided some explanations (thanks to the net). This article leads to a discussion of the Famine and its effect on our family. I will deal with that in detail in a later article, so only peripheral comments will be made here. There was a layered class structure: head landlords, gentry farmers, middling farmers, small tenant farmers, conacre cottiers and landless labourers. A cottier in Ireland (c.1700–1850) was a person who rented a simple cabin and between one and one and a half acres of land upon which to grow potatoes, oats and possibly flax. The ground was held on a year to year basis and rent was often paid in labour. Usually, the land available to the cottier class was land that was considered unprofitable for any other use. The cottier existed at subsistence level because of high rentals and the competition for land and labour. The more prosperous cottier worked for his landlord and received cash after rent and other expenses were deducted. There was no incentive to improve a holding as any such improvement usually prompted a rent increase. During the early decades of the nineteenth century, the situation for cottiers worsened considerably as the population continued to expand and in turn led to the dramatic events of the Irish Famine of 1845–49. After the Famine, the cottier class almost completely disappeared (as did our family). Conacre (a corruption of corn-acre), in Ireland, is a system of letting land, formerly in small patches or strips, and usually for tillage (growth of corn or potatoes). During the 19th century, conacre land was normally let on an eleven month system - considered to be of sufficient length to sow and harvest a crop but without creating a relationship between landlord and tenant. Holding the land under conacre granted no legal rights to the land with rent being paid in cash, labour or a combination of both. Some historians believe that it was one of the factors responsible for the Great Irish Famine. The land owner would manure the land before letting, usually at a rate of between £6 and £14 per acre in 1840. The principal defect in the practice was the nature of its speculative system; the labourer who took the land was frequently an indigent speculator who, dependent on the weather, either made a profit or faced ruin. During the 19th century, there were many cases of middlemen renting the land and then sub-letting on conacre to desperate landless labourers or cottiers at a high profit. A farmer would have been considered comfortable on 50 or more acres. While the average small tenant farmer on 5 to 30 acres could usually provide a basic living for a family, the prospect of poverty always remained. On the eve of famine in Kerry 87.4% lived in poor circumstances – exceptionally high compared to national figures. While small tenant farming families were increasingly susceptible to poverty by mid 1840s this generally fell short of excessive and oppressive destitution experienced by landless labourers. 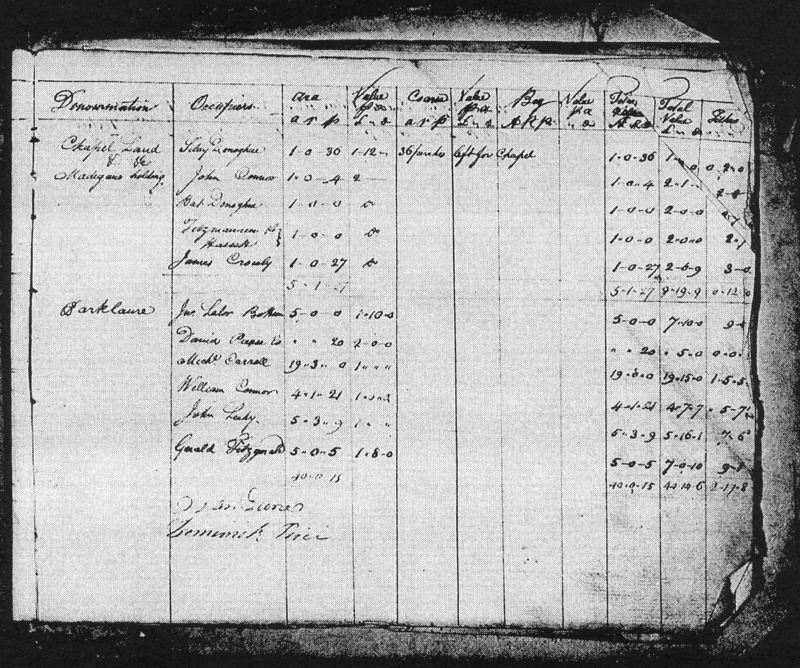 The Tithe Applotment Books (TABs) are a vital source for genealogical research for the pre-Famine period, given the loss of the 1821-51 Census records. They were compiled between 1823 and 1837 in order to determine the amount which occupiers of agricultural holdings over one acre should pay in tithes to the Church of Ireland (the main Protestant church and the church established by the State until its disestablishment in 1871). Land measurement has changed a lot since the early 19th C. I do remember being taught about acres, rods, poles and perches at school, but then I am in my 70s! Rods, poles and perches used in the TABs are different names for the same unit sometimes! Other times the rod or rood is a separate measurement. Confused? So am I! It is this group who will have been the heads of households when the TABs for Rattoo and Killury civil parishes were recorded in 1825. All the townlands mentioned are very close to Ballyduff. The entry covering Sylvester is on the top line on the sheet below and he is named as Silvy. He was living in Chapel Land which would have been right behind the church. His holding was only 1 acre - 0 r (rods) - 36 p (perches) and rented at £1-12s per acre. It also says that the 36 perches were left for the Chapel, which implies some sort of relationship. This amount of land would classify Sylvester as a cottier and very poor, so how could he have afforded a large mausoleum in Rattoo Churchyard? The TABs only covered agricultural land and I suspect that he actually lived in Ballyduff village and like his brother James did some sort of trade. Perhaps this was his allotment. A Bartholomew or Bat, as he is shown, also lived on Chapel Land and occupied 1 acre - 0 rods - 4 perches and paid £2/acre. Similar comments probably apply to him as to his brother, Silvy; he was probably an artisan rather than a farmer. Whichever was the son married Bridget Ferris and there is a John Ferris in Lacka (again very close to Ballyduff) who occupied 110 acres rented at 15s/ acre because the land was poor with about half being coarse and bog land. Bishopscourt is the townland where one of the three major landlords lived, Thomas Stoughton, and is right on the edge of the village. John occupied 14 acres and paid £1-12s/acre which is the same rent as Sylvester. Also we find Michael Ryle in Bishopscourt with a holding of 24 acres. He is almost certainly the father of Thomas Ryle who married James’s daughter Mary. Maurice Nelan occupied 64 acres at a rent of £1-14s/acre in East Knoppoge, which is also right on the edge of the village. This holding would suggest a comfortable farmer and a good marriage for Ellen. In 1825 Richard Griffith was appointed by the British Government to carry out a boundary survey of Ireland. He was to mark the boundaries of every county, barony, civil parish and townland in preparation for the first Ordnance Survey. He completed the boundary work in 1844. He was also called upon to assist in the preparation of a Parliamentary Bill to provide for the general valuation of Ireland. This Act was passed in 1826, and he was appointed Commissioner of Valuation in 1827, but did not start work until 1830 when the new 6" maps became available from the Ordnance Survey and which he was required to use as provided for by statute. He served as Commissioner until 1868, when he was succeeded by Sir John Ball Greene CB, who then took charge of the ongoing revisions of the valuation on an annual basis. Griffith also served as Chairman of the Board of Works. He conducted two major valuation surveys. First, was the townland valuation, which was completed in the 1840s and which took the townland as the geographical unit of valuation. 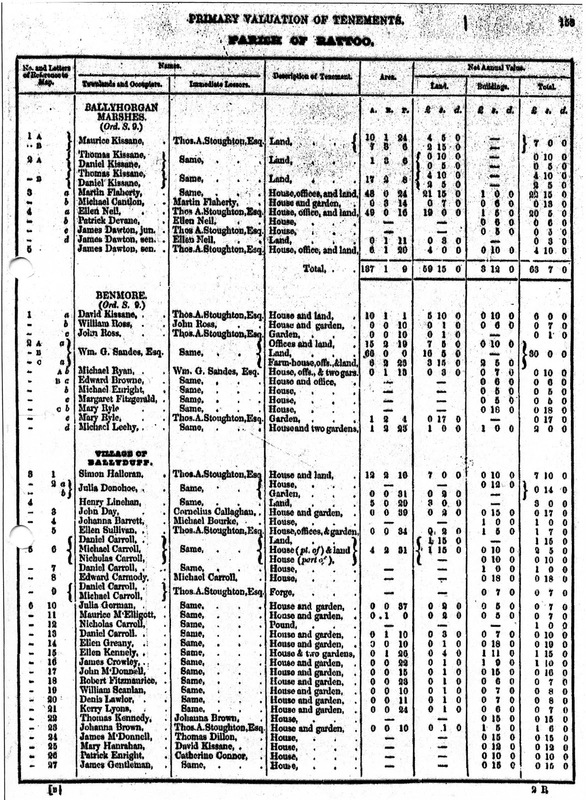 The second and more extensive, was the tenement survey which valued individual property separately for the first time and which also valued all buildings in the townland for the first time, whereas, heretofore only the larger houses, principally those of the gentry had been valued in the first valuation. Ballyduff was valued in 1853 by which time most of our family seems to have left Ireland. However, as the Griffiths record shows (see at the end), James’s wife Julia (or a daughter of the same name) was still living in the village. And Mary Ryle, her daughter (or sister), was living down the road in Benmore. Both were occupying houses with a garden. Sean Ryle, Mary’s descendant, tells me that by 1864 Mary had taken over Julia’s house. There is a lot more for me to do with the TABs and Griffiths. I will research all the other names with which we are associated. My next visit to Ireland will be to Dublin to look at the available land and will records. The Registry of Deeds was founded in Dublin in 1708 but its heyday, in terms of popularity, was 1750-1830. Most deeds in the Registry concern leases of land and property rather than ownership so the Registry of Deeds is not the exclusive preserve of the aristocracy or gentry. For a lease to require registration, it needed to be for 31 years or three lives; such leases were more likely to involve 'second level' landlords. Most farmers and small holders, had leases for a year (or 'at will') which were not registered. It is probable that our ancestors fell into this category but it will be worth a look. These sale particulars provided details of tenants on the land, together with the value and terms of their tenancy or rental commitment. They cover the entire island of Ireland. Genealogical potential is significant, since more than 500,000 tenants are recorded in the collection. These records are known as the Landed Estates Court Rentals and again are worth looking at.